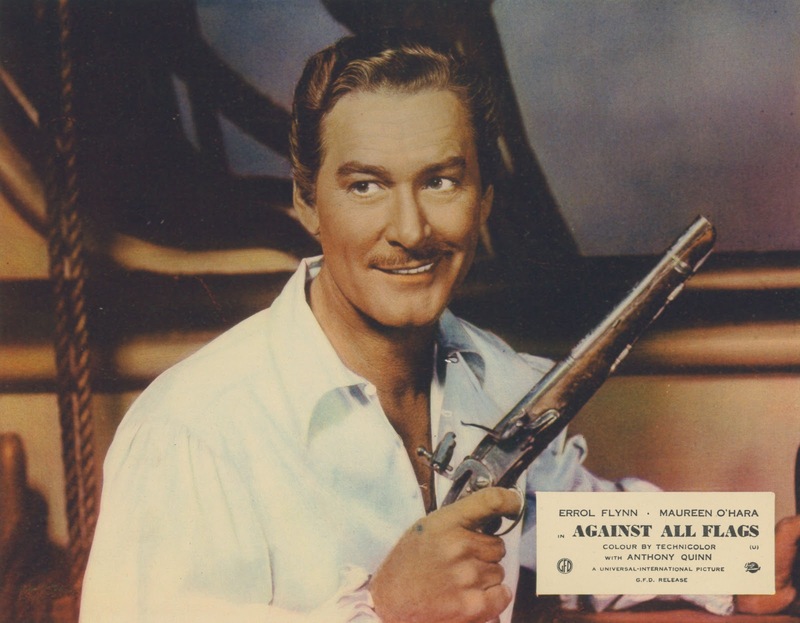 Among the unexpected to show up on Region 2 Blu-Ray comes Against All Flags, a costume actioner Errol Flynn did for Universal-International shortly before truest career plummet began. Did U-I maintain standing sets for repeated pirate forays their contract and guest players took? Certainly these had polish, if not lasting value, of Warner, or even Fox, sailings. I watched Flags close for economies, there in abundance, but not once does it openly cheat, as pretender sword pics oft-would. 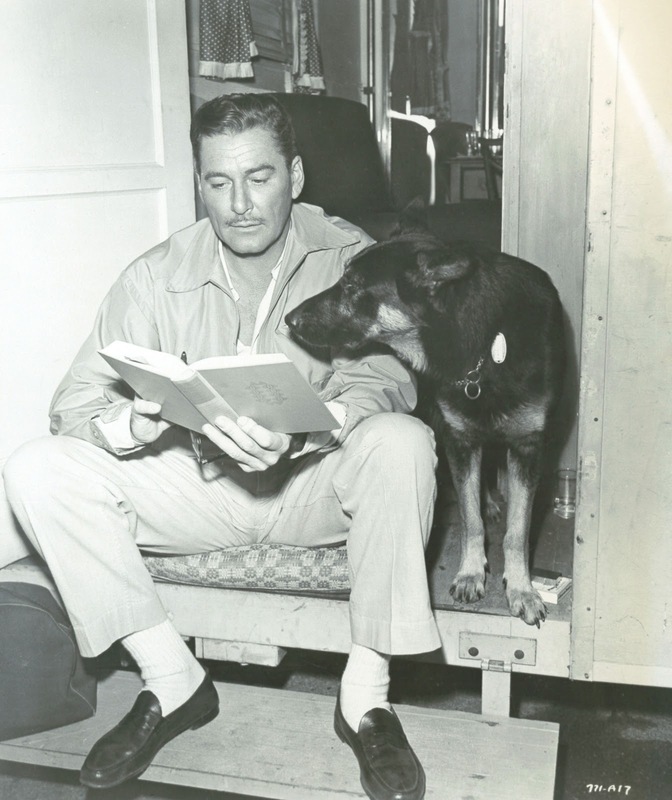 Errol looks surprisingly preserved as well --- did he behave in hopes of continued Uni work and more percentage pay like Alan Ladd, Jim Stewart, and Tyrone Power were getting? Flynn was represented by MCA agent Lew Wasserman, lately responsible for getting Stewart 50% of profit flowing from Universal's Winchester '73, a deal said to have yielded upwards of $600K to the actor. Soon enough came other name players beating at the percentage door. The money seems to have been real enough, at least for some. 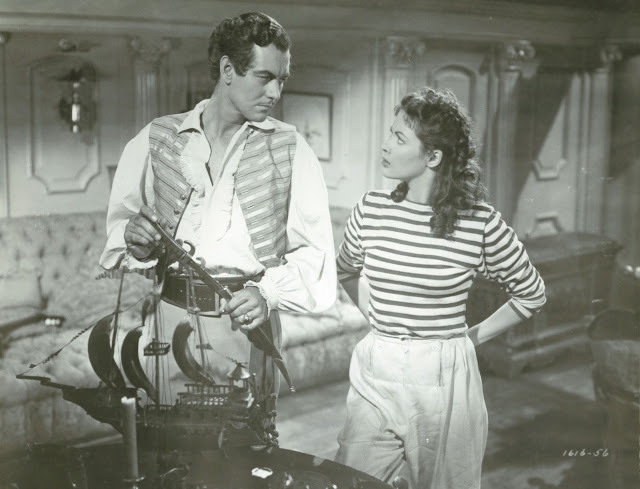 Tyrone Power allegedly took $750,000 by The Mississippi Gambler's theatrical wind-up. 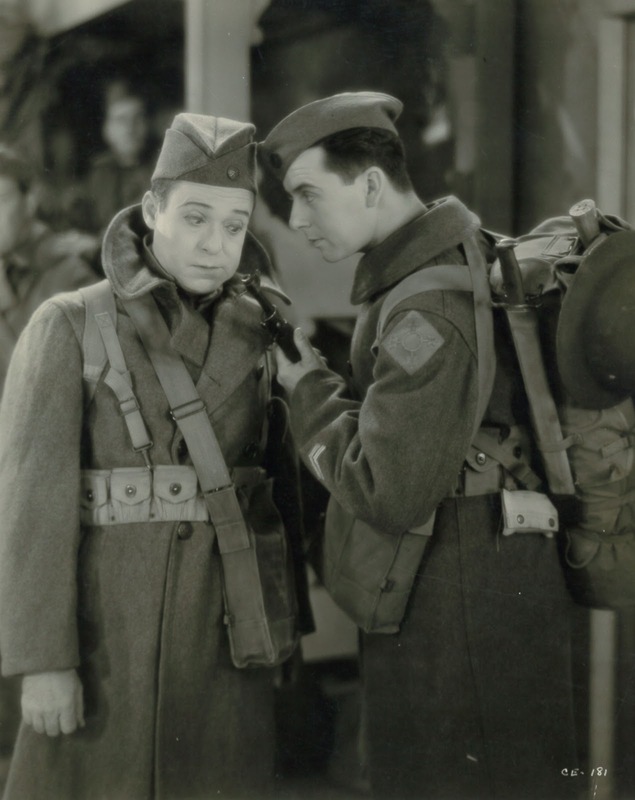 Alan Ladd was satisfied enough with Desert Legion to stay on for Saskatchewan. Wasserman by 1951 represented power beyond that of most studio heads. 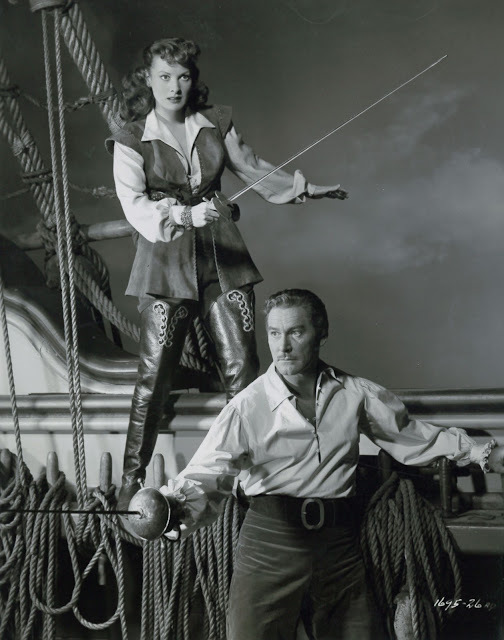 He had succeeded in re-negotiating Errol Flynn's Warner pact to allow outside pictures, one per annum, Against All Flags to be the star's first go at profit participantion with Universal. 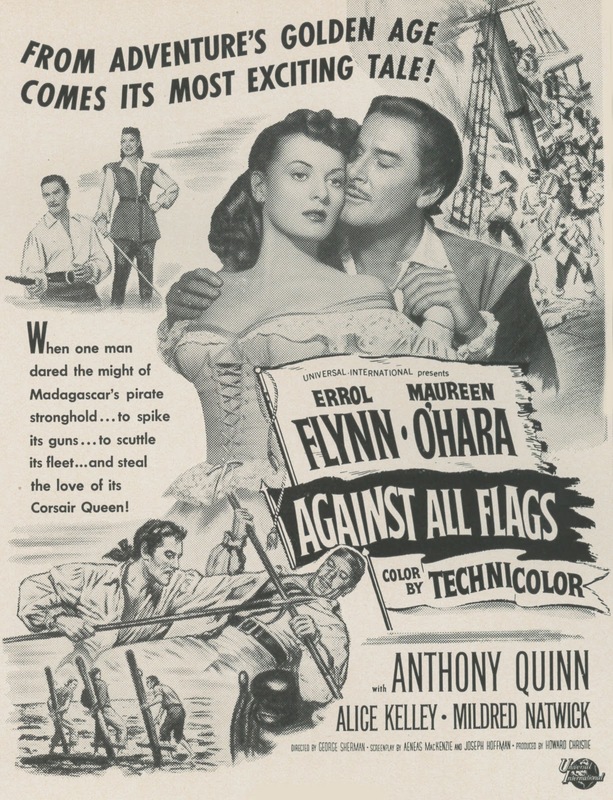 Flynn's doubled a lot in Flags --- Blu-Ray betrays such in action not as noticeable before. Were 35mm Tech prints so sharp as HD projection? I've gone long enough with digital to have near-forgot. You're way past surfeit of this stuff when sword scuffles become more a matter of spotting stand-ins than what action is performed. 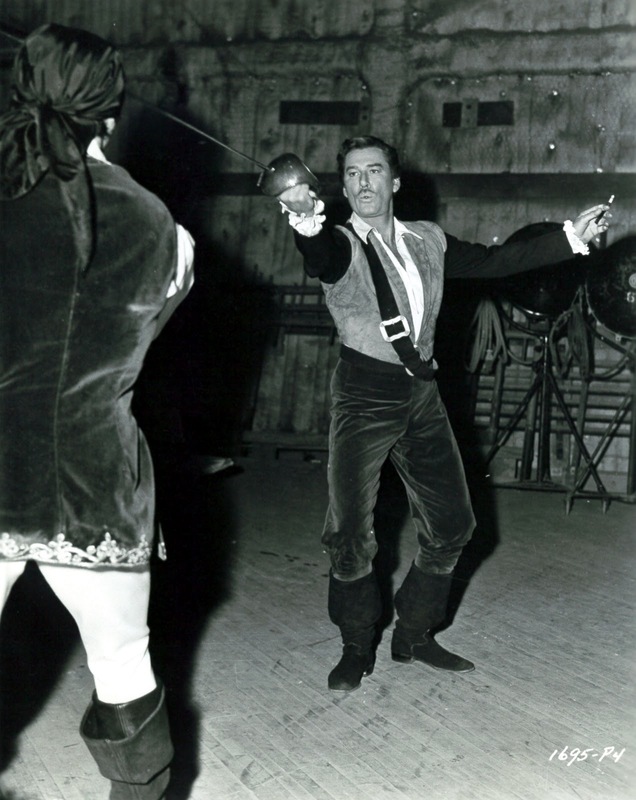 Flynn was good with medium-shot dueling ... sometimes he'd get too frisky, or in cups, so opponents got cut. Didn't I read where young Chris Lee spilled blood a few years later on TV's Errol Flynn Theatre wherein he guested? There is Maureen O'Hara as a lady pirate, loath to kiss Errol unless it's her idea. Was she any sort of feminist role model ... ever? ... or did too many pairings with (and spankings from) John Wayne scotch O'Hara placement among icons for gender equality? She's actually good with a sword, near so as Flynn. Small wonder Universal touted their teaming as one that had to happen. 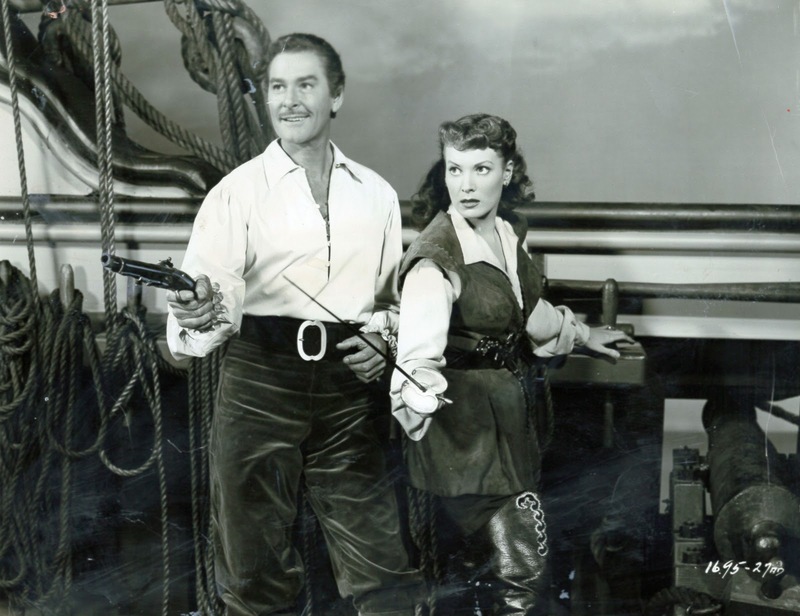 Blu-Ray supports O'Hara's rep as a (no, the) Queen Of Technicolor. With lards of damaging make-up they used to put on stars, especially for Tech work, I'm surprised her complexion stood up to years of such application (and maybe it didn't, as unretouched stills of any Gold Age femme star are hard to come by). George Sherman directed Against All Flags. He knew action from herding horseflesh and cowboys mounted thereon. I'll bet he finished this under budget. Sherman's is effort we call "workmanlike," by no means a pejorative, as age and further exploration of modest output makes me better appreciate pro jobs done by journeymen still awaiting their due. 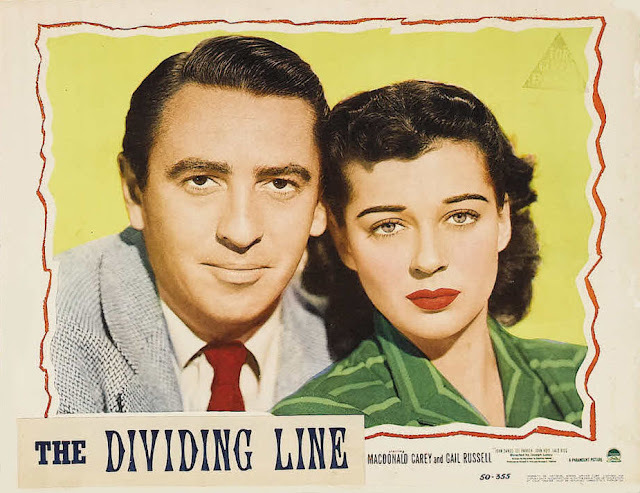 Universal saw Against All Flags highlighting a '52 season --- this was a money show and they'd spend (comparative) lots to put it equal as possible with period-dressed Metro, the latter's Stewart Granger series by far richest of adventure writ with feathers. Just having Flynn got AAF in venues less receptive to Uni programmers Tony Curtis or Jeff Chandler top-lined. 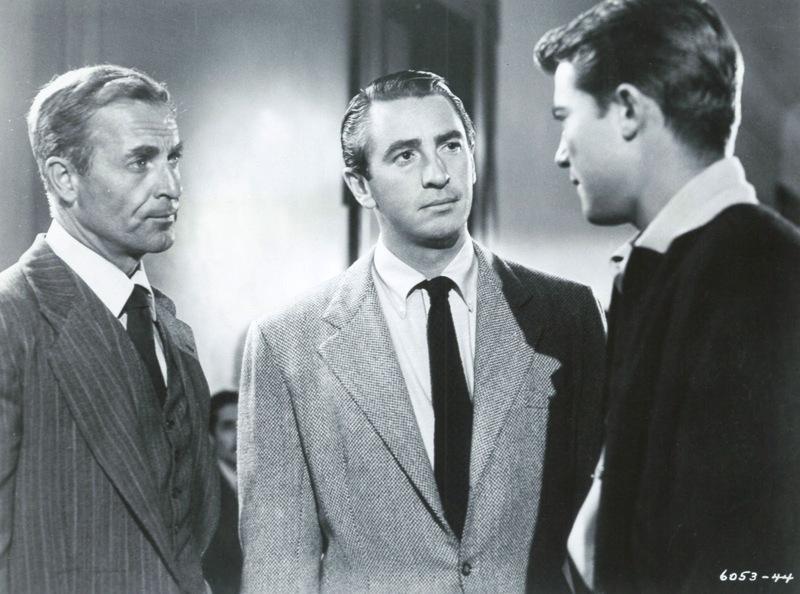 It was sure-fires like Flynn, Stewart, Ladd, and Power that gave U-I revenue to develop in-house Curtis, Rock Hudson, and others who'd come to represent stardom for 50's youth, and indeed, it was company quest for unassailable A's that made them roll over for big-name % demands. Universal's were otherwise the dime comic books of pirate movies. Looking at one was same as watching six for as much as they varied. Star potential was tested, option pick-ups determined by how (mostly) kid/teens responded to new faces. 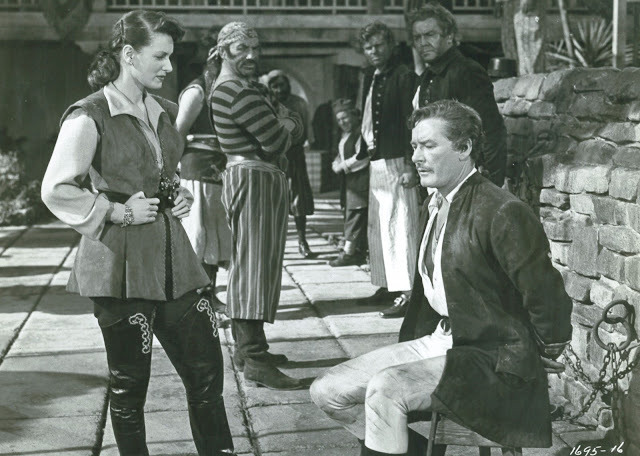 Some clicked, like Yvonne De Carlo as titular Buccaneer's Girl in 1950, but opposite number Philip Friend, "introduced" here (despite being in pics ten years), didn't register and walked the plank. Such product serviced what was left of a movie-mad public, down principally to youth, enough of them fortunately there to generate profits so long as Universal kept costs at bay. 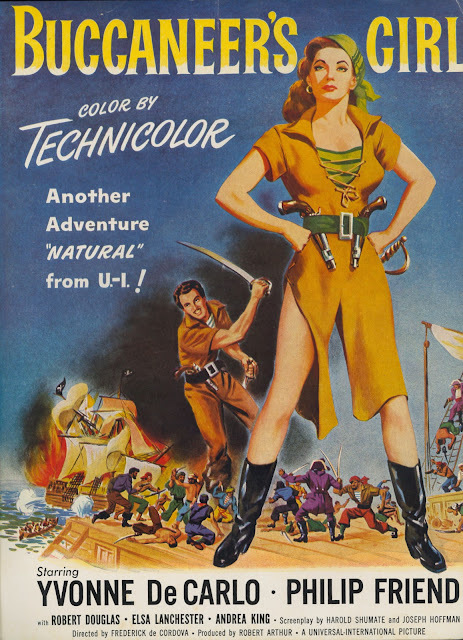 Technicolor was a common thread through postwar U-I actioners, westerns and costume piece alike. Whatever deficiency lay in script or direction saw compensation for being at least pretty to look at. With proper DVD delivery, many still are. 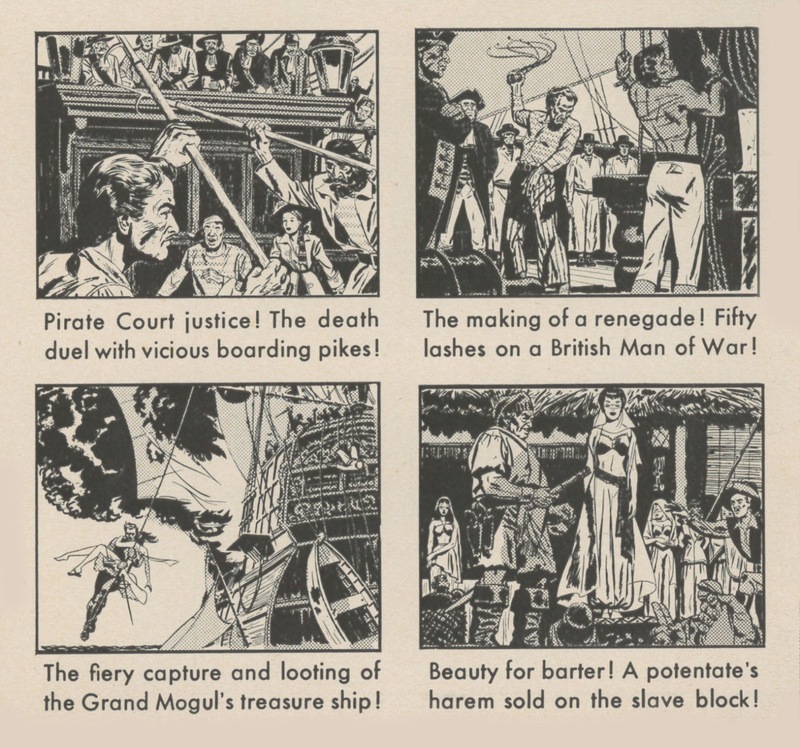 Part Two on Universal-International piracy is HERE. 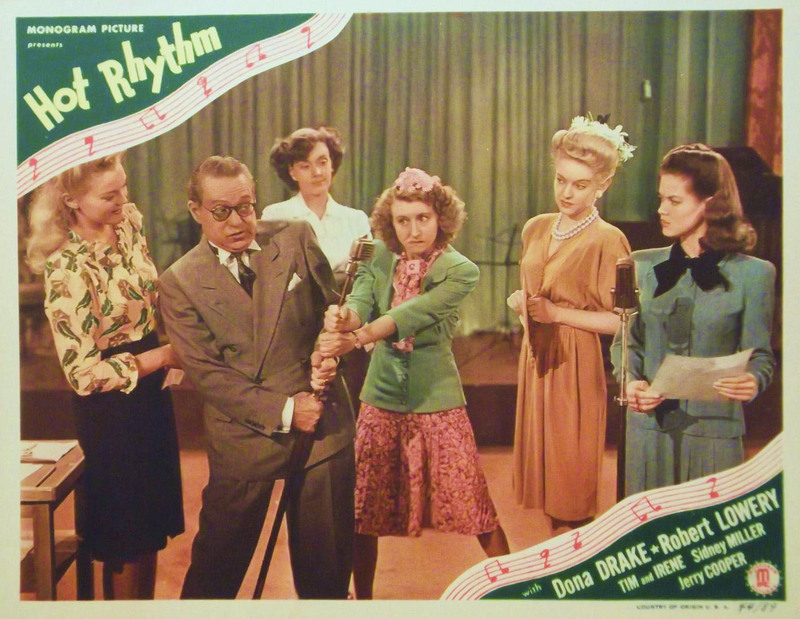 One was Hot Rhythm (1944), just another that previous historians would label Poor Harry In Decline, but showed to this viewer what magic he wrought as character comic support to low-cost jivin' Jack (Robert Lowery) and Jill (Dona Drake), Monogram's hope for song-and-romance tandem to rival elsewhere teams. Every time Harry walks in, the joint lights up, especially his tiltings with eccentric-and-then-some Irene Ryan, years back of Granny Clampett, but no less mirth-making for the gap. What I notice about late Langdon is how well he mingles among both straight and comic talent. 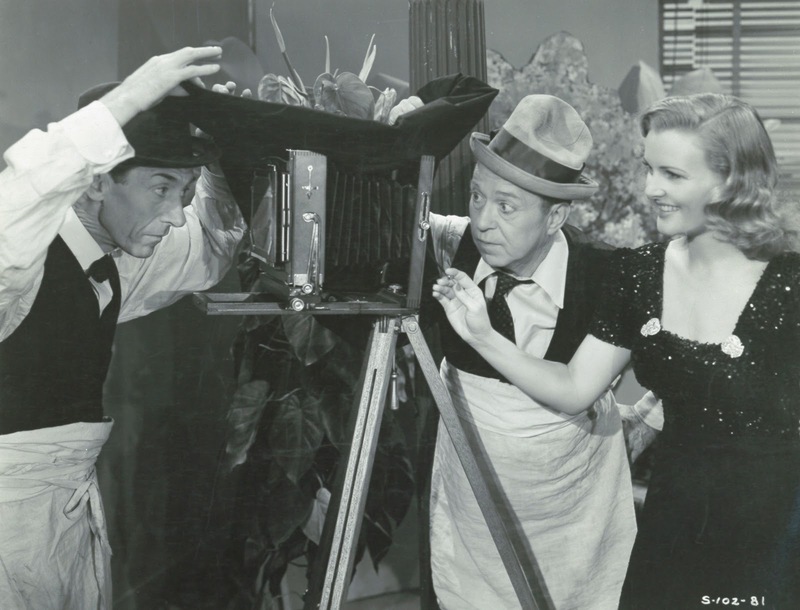 Stan Laurel observed HL had the makings of a great actor in addition to humor gifts. These Monograms prove it, as does support turns done for others, like Swingin' On A Rainbow at Republic. Hang it, though, for so few in circulation. Hot Rhythm streams on Netflix, but I only got over the Rainbow via Cinevent 2010, where collector/historian Richard M. Roberts ran his seemingly one-of-a-kind print. I wish too that TCM would re-run Langdon's 1929-30 season shorts for Hal Roach. These came after the feature fall, and all have points of interest. In fact, Harry occupied many and varied cribs over those twenty plus years he filmed. Work was where HL could find it, meaning you'd see him doing a commercial subject here (for B.F. Goodrich tires), teamed there & thither with El Brendel, Una Merkel, many others. 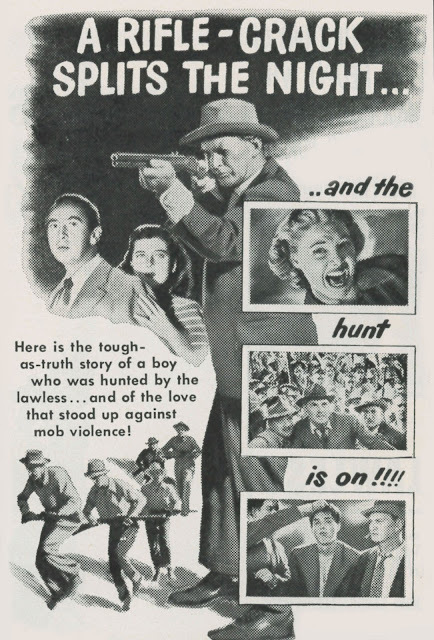 He'd walk on even to an East Side Kids frolic (Block Busters in '44). Much of these were toward the end, Langdon still game whatever the circumstance. The fact he was expert at gagging made work easier for crews in a (customary) hurry on low-budgeters. The Little Elf authors confirm Langdon's having more comedy acumen in small digits than whole teams banging rival typewriters. So just how many laff-makers were so sharp as Harry then? Another thing this book does magnificently is reconstruct lost Langdon, including shorts for Sennett long gone, talking comedies unseen since early-30's newness, and appendix-placed Heart Trouble, detail-covered in closest-to-actually-seeing it mode (which I guess we never will --- Harter/Hayde couldn't locate a screening after 1931). Conflicts Langdon had with Frank Capra are definitively dealt with, a wonderful introduction to Little Elf by ace scholar Edward Watz adds much to what we know of Capra vis-à-vis Harry, with Raymond Rohauer anecdotes (always welcome) for a sweetener. 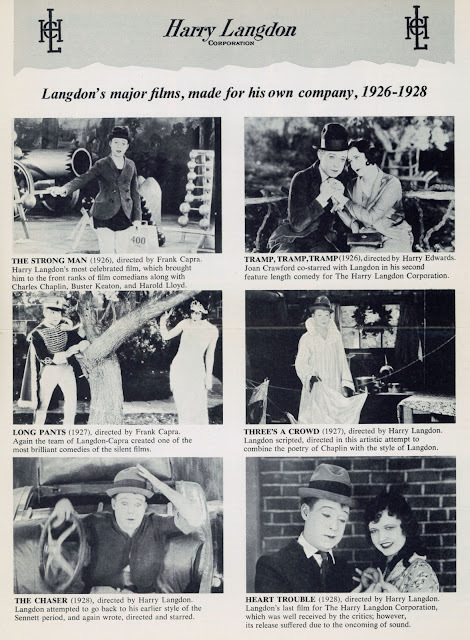 Harter/Hayde devote their bio epilogue to the afterlife of Langdon's image and his films, bringing on TV airplay, compilations (such as Robert Youngson), Blackhawk selling on 8/16mm, plus postures previous writers have taken re Harry's rise and crash. It's the best summary thus far tendered, certainly a fairest and most informed. You'll not believe all the dope these authors found on pre-movie Harry. Little Elf is like innards of a long-forgot theatrical trunk filled with Langdon lore. I'm amazed such stuff survived, let alone that 2012 diggers could get at it. There are even scripts for HL's vaudeville turns, written, of course, by him. I came away from Little Elf thinking anything's possible --- will Harter/Hayde be the guys who someday find Heart Trouble? In the wake of this book, I won't be surprised. Noteworthy is over five hundred illustrations throughout Elf's pages, much being trade promos, rare ad art, wire photos --- lots new to me --- and culled from Langdon stashes far and wide. 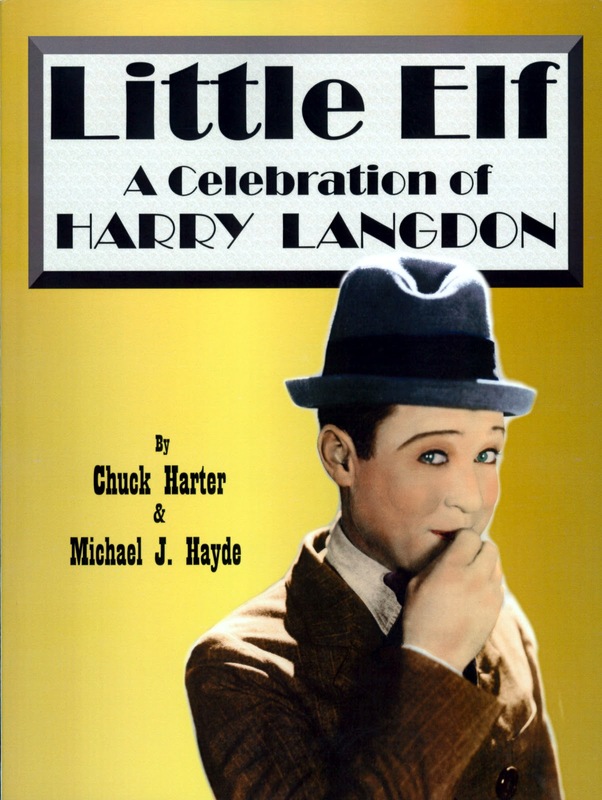 Little Elf is more than a book about one comedian --- it's masterly coverage of an era and the many whose orbits Harry crossed. 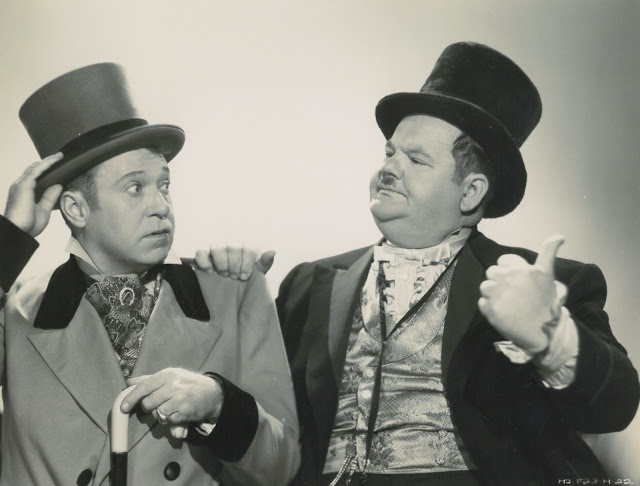 Cameos, many extended, include Mack Sennett, Hal Roach, Laurel and Hardy ... the list encompasses most every headliner of Langdon's day. I'll be in and out of this book over pleasurable months to come. 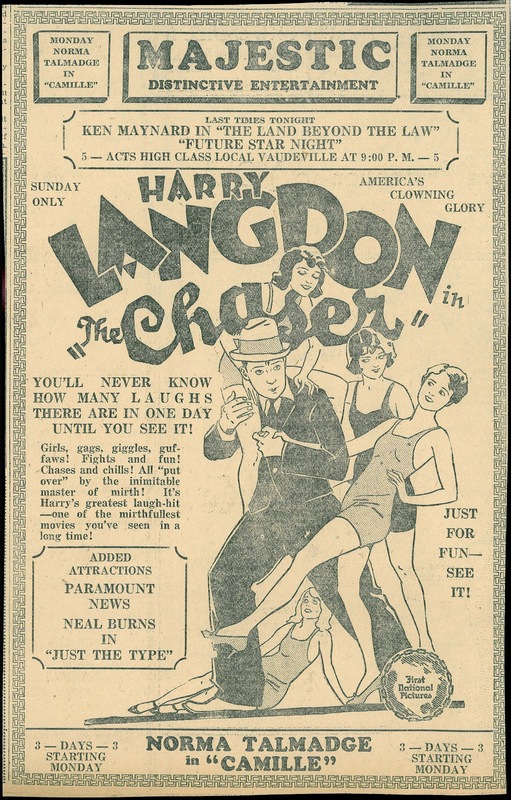 Certainly for whatever Harry Langdons I screen, it'll be sitting in my lap. 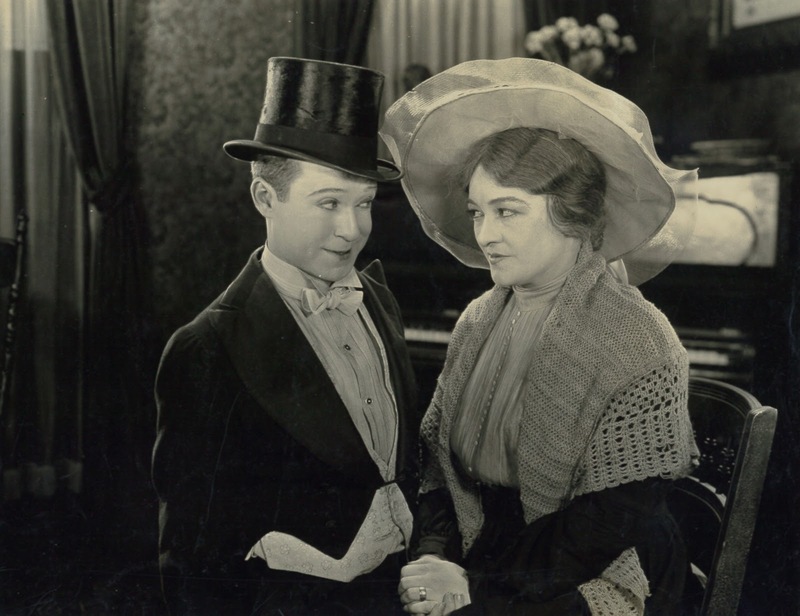 More Harry Langdon at Greenbriar Archives --- Part One and Two. 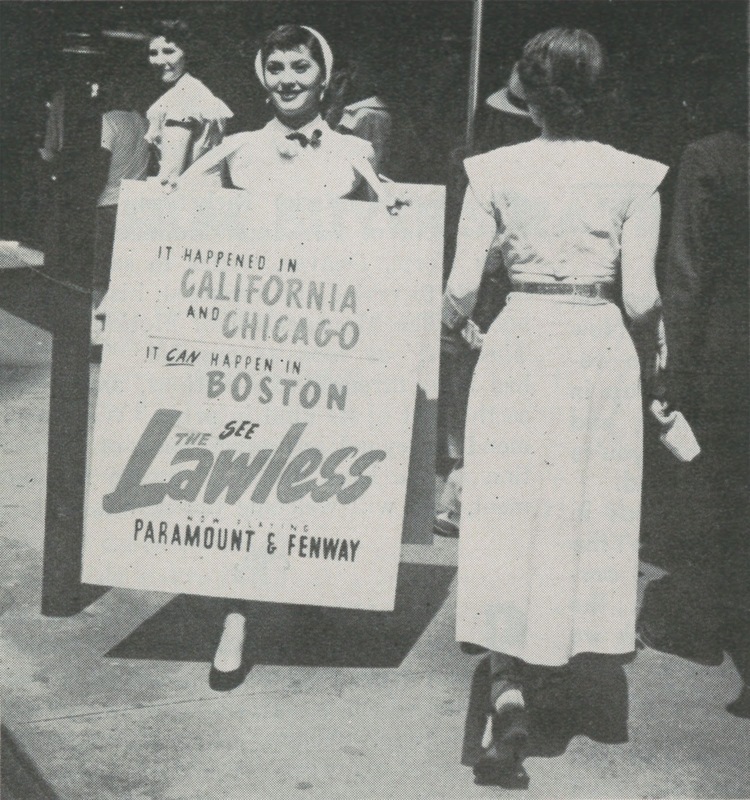 Pine/Thomas and Paramount were well armed going into June 1950's pre-release of The Lawless. Reviews were mixed but mostly encouraging. Its heart is in the right place, said The New York Compass, despite The Lawless being not by any means polished. Critics liked the message even as the picture's path to greatness is obstructed (NY Post). 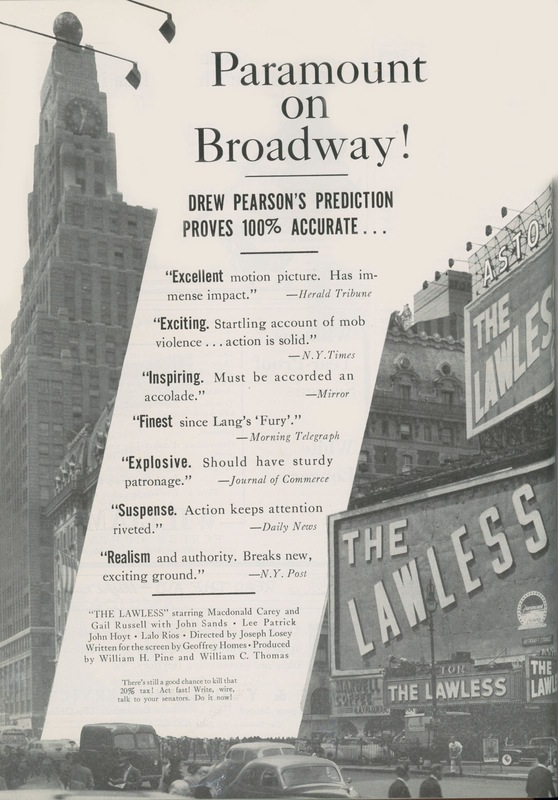 The two Bills did hit a bull's-eye inducing big name columnist/commentator Drew Pearson to narrate their trailer for The Lawless. Pearson lent gravity to the enterprise worth a peck more than mere squibs from lesser lights, his the beacon millions of readers followed (Pearson is probably fan-known best today as the host/narrator of Fox's year later The Day The Earth Stood Still trailer). To further pitch the social-issue weight he was pulling, Bill Pine took Mexican-American carpenter-turned-actor Lalo Rios to visit church and women's groups in cities where The Lawless was set for pre-release dates. Paramount's deal with eight venues getting first (and exclusive) play on The Lawless called for each to run it as a single --- no combos or supporting features. Several among these must have got cold feet, as the bargain was not kept. What became clear was fact that June's were do-or-die engagements. If Paramount was going to stay behind The Lawless, the film would have to break out here and earn sleeper status insiders had predicted. Ominous was thoughtful pics lately getting a black eye at ticket windows. Whatever vogue they'd had was in a 40's past. Barney Balaban sounded off at a mid-June confab of Paramount sales staff where belt-tightening was Topic A, and there'll be no more arty, critically praised productions that are a thing of beauty but with few customers, he added. Had Barney just come off inspection of low receipts for The Lawless? Pine/Thomas were still bullish, predicting, said Variety, an eventual net profit of at least $1,000,000. 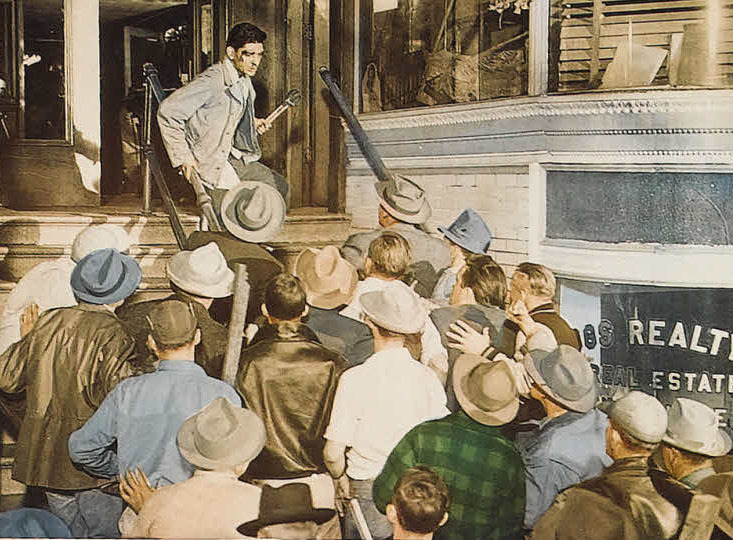 They even pledged ten percent of Lawless profits to Paramount branch managers, salesmen, bookers, and field exploiteers, a 240-odd group of beneficiaries --- and they'd get quarterly statements with their checks for as long as they stayed on staff! A balloon this inflated had to be popped, and word from the pre-release did just that. The Lawless pulled a first week's "great" $15K in San Francisco, maybe due to its nearby story setting, but biz elsewhere didn't come near their haul. Buffalo was "fair" ($9,000) ... at least The Lawless played a single there, but Boston, Baltimore, and Detroit took the bobsled. 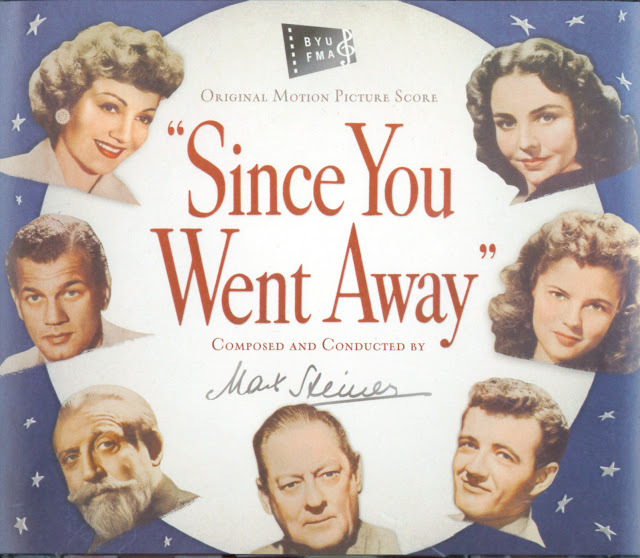 These broke faith with Paramount by adding co-features: a Gene Autry here, a Roy Rogers there, or worse, a "B" out of Monogram, Father Makes Good --- each was fine in and of itself, but this was not company Para sales wanted its prestige pic to keep. Even hope of a click in Gotham was dashed, The Lawless opening there in late June at the 1,300 seat Astor Theatre. Very slow was their two weeks play-off, $12K in a first, $8K for the second. What biz The Lawless drew was attributed to a July 4 holiday boost. Variety's nationwide tally for June called Paramount's effort extremely spotty to date. Further tie-ins with schools and civic groups weren't helping, as screenings followed by egghead discussion was like anchors tied to mass patronage. Paramount seemed ready to pull plugs on that big push they'd pledged, and who could blame them? There was surer cash in ongoing juggernaut Samson and Delilah and My Friend Irma Goes West, Para's two other July centerpieces, and both hits. 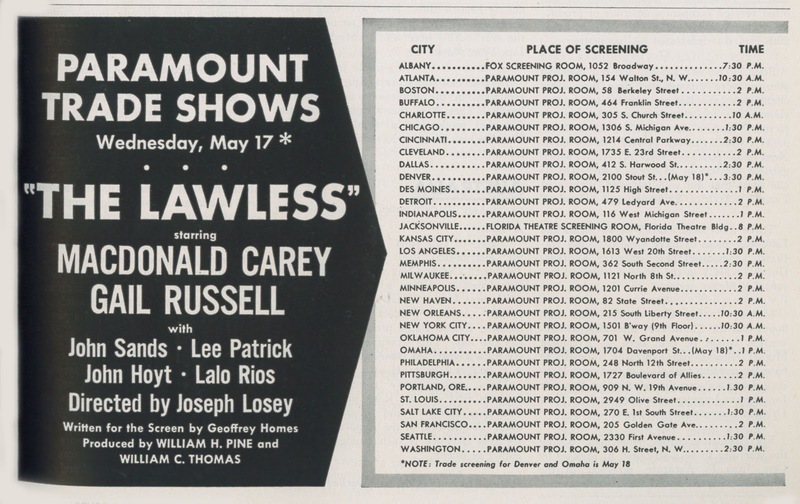 Autumn months saw The Lawless playing as a second feature to safer bets like Broken Arrow and, in Chicago, even Pine/Thomas' own Tripoli. At least Omaha tried helping with popular orchestra man Blue Barron and his stage revue --- light receipts here were attributed less to The Lawless than sport events on TV that siphoned off matinee trade. It was small towns that really ripped The Lawless. Was this cowboys, a melodrama, or what the hell? They'd take their genres straight, thank you. Used instead of a western --- sorry I did, came word from Paynesville, Minnesota, Plenty of action, but my farmers and cowboys want a western. Robert H. Perkins of the Lynn Theatre in Woodbine, Kentucky put rhetorical spin to his comment ... It's another of those "lesson" films. Maybe your customers go for them. "Woody" at the Palace Theatre in Golden City, Missouri seems to have missed Pine/Thomas' point altogether: A messed-up try at a super western. Very poor draw in a theatre that thrives on westerns. The Motion Picture Herald maintained a weekly chart where independent film buyers rated movies. They were honest, sometimes brutal, and gave The Lawless an acid bath --- none called it Excellent, two said Above Average, seventeen went with Average, thirty-seven Below Average, and twenty-three Poor. Bill Pine was philosophical by a scorched November. He told Variety that The Lawless might have been more successful if released a year earlier, when much of the public "was actually going to see message films." Bill added that he and his partner were still glad they made The Lawless because it was the first time they'd done "a real critic's picture." Admitting it wasn't as profitable as their others, Pine and Thomas at least "proved we're guys whose only interest isn't making money." 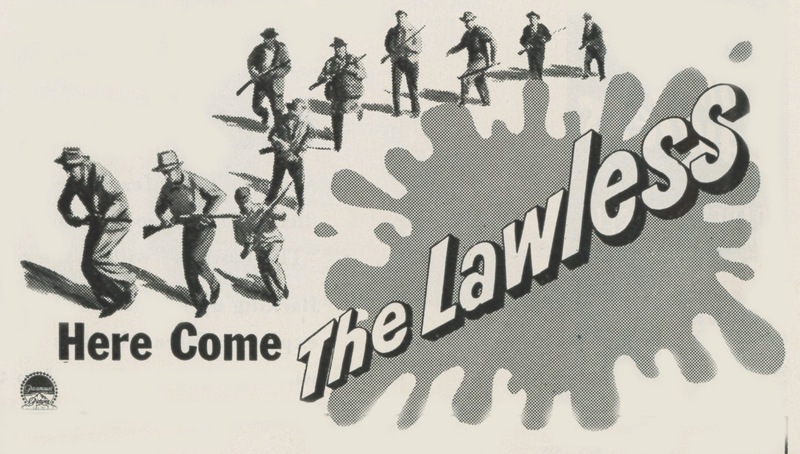 As to afterlife of The Lawless, there was 1960 syndicated-to-TV release amongst a group of twenty-two Pine/Thomas post-48's, most in color. I found no indication of The Lawless being shunned by programmers. Indeed, there are listings in a number of vintage TV GUIDES I've come across. What we haven't had is wide exposure on satellite and cable carriers, but that seems to have been the case with most Pine/Thomas titles (some of them are streaming on Netflix, however). My query: Does Paramount own all of these at present or do P/T heirs still maintain a controlling interest? The Lawless was a 1950 Paramount release that some say fell into a sinkhole (for its hard-hitting socio/political stance?) and only now is rescued via Olive's DVD sub-license of Para vaulties. Spun off incidents where Mexican-American fruit pickers were California-oppressed, The Lawless was tabbed by producers William Pine and William Thomas to depart genre formula up-to-then adhered to and try something "significant" after profit-making example of late 40's Crossfire, Gentleman's Agreement, and others scraped off cultural underbellies. "The Dollar Bills" were so-named as purest expression of showman love --- fifty-four pics from Pine/Thomas so far were as many hits for theatres playing them --- both Bills up from exhibitor ranks to deliver product they knew buddies still in trenches could sell. The two kept a winning streak, and used it, to play this wild card called The Lawless and wangle Paramount financing of the negative. 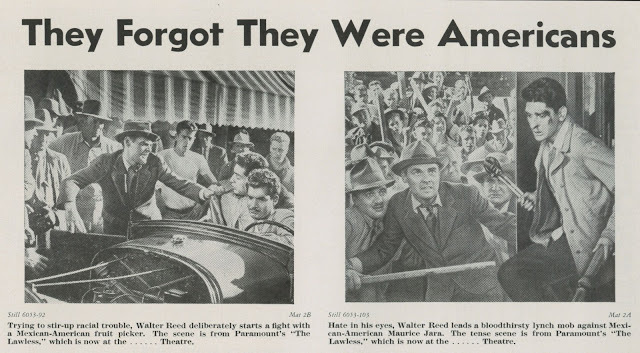 Remember heroic King Vidor talking Metro/Thalberg into The Crowd? Well, the Bills went him one better here, and against bigger odds. Too bad theirs came a cropper and put both in retreat back to formula. Sixty years' seeming internment of The Lawless was no one's plan. It was just placement of the show among Pine/Thomas holdings sold outside Paramount post-48 packages and consequently used by less TV station outlets. 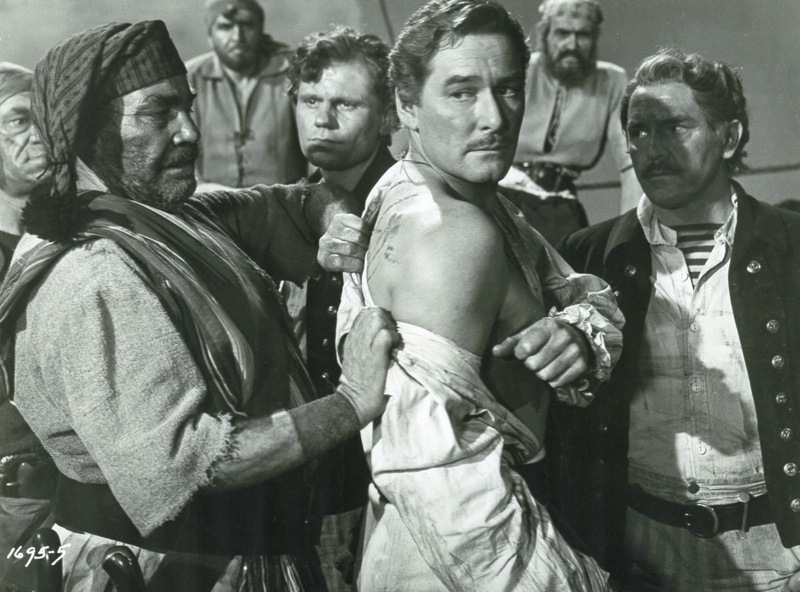 We've had as tough a time seeing The Eagle and The Hawk (1950), Captain China, and The Last Outpost (still do). I don't know of any P/T's being released to video thus far --- is The Lawless a first? (Run For Cover is also just out). Anyway, there's not another one like it, at least not in their inventory. 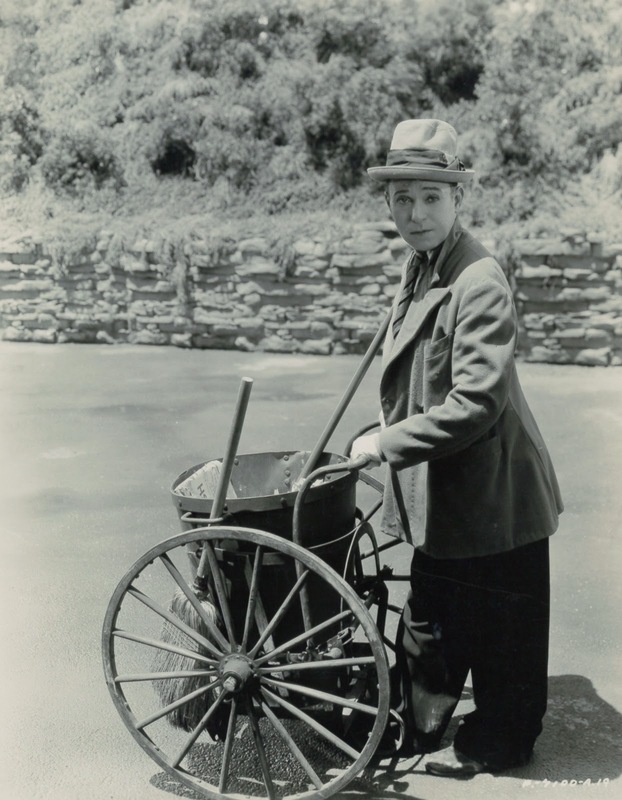 Bill Pine died young (59) in 1955. Up to then, he and Thomas were the whirling-est dervishes in all independent picturemaking. A look at unceasing output makes me wonder when the two slept (they'd slowed down from eight a year to four when The Lawless got made). Paramount had been distributing for Pine/Thomas since 1941, stuff like Power Dive, Wildcat, and I Live On Danger. Where theatres needed second features and action filling, such was made to order. The Bills had served time sufficient to try something different, though The Lawless wouldn't stray too far off beaten paths of action melodrama that provides plenty of exploitation elements (Variety). Certainly a trade wanted these good soldiers to succeed. Pine/Thomas hedged bets by spending a minimum ... 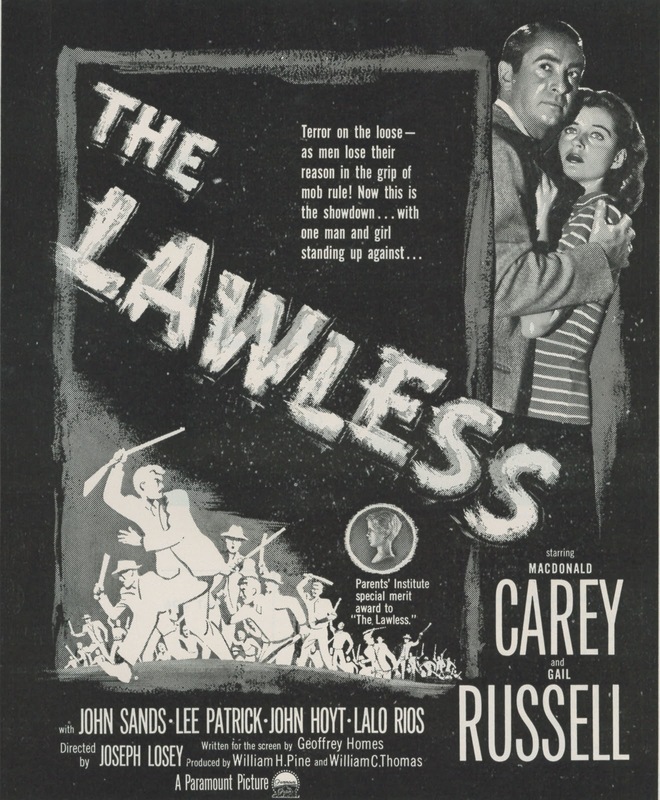 The Lawless cost $435,000 and was shot in eighteen days on small town location (Marysville, Calif.). 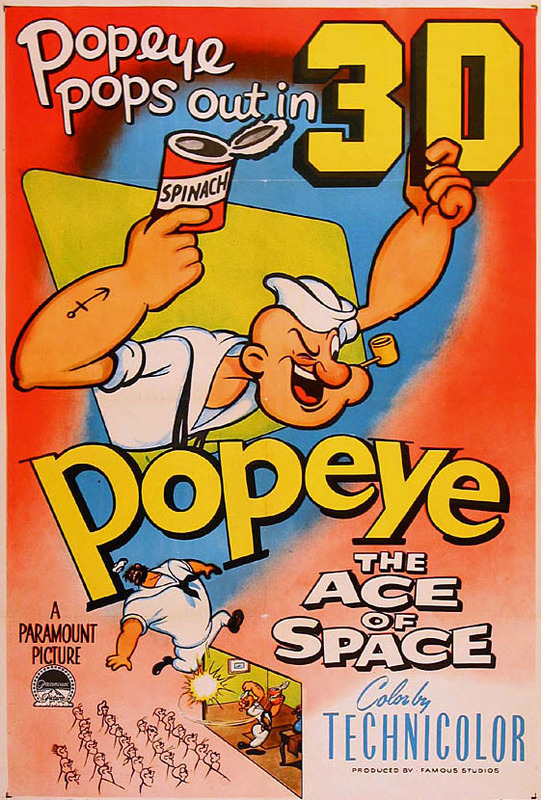 This was good value for product that Paramount hoped could be sold as a single-billed "A." 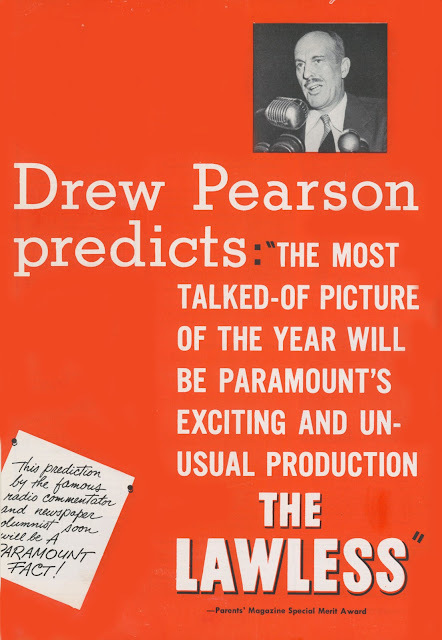 The studio got its peek in February '50 and "received enthusiastically" The Lawless. According to Variety, execs agreed with Pine and Thomas that Lalo Rios, the LA carpenter-turned-actor making his screen debut as the would-be lynch victim, should receive a special "introduction" screen credit. Para also promised "big budget ballyhoo" to launch The Lawless. 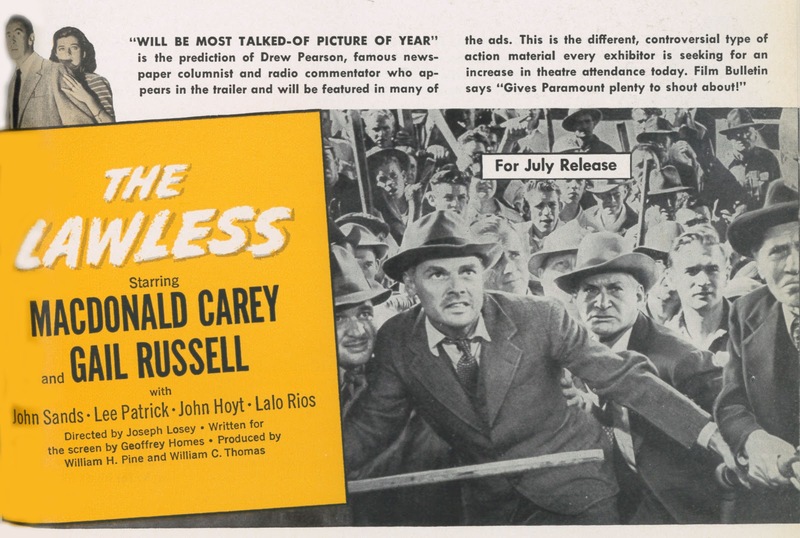 An "all-out exploitation surge" would send players Macdonald Carey, Gail Russell, and aforementioned Rios to cross country barnstorm (Russell dropped out, but the others hit roads extensively on the pic's behalf). By mid-March, and midwest exhibitor previewing, Paramount was convinced this was homegrown merchandise to outshine Paisan, Open City, and others of Euro art origin. The Lawless had the appeal for both the adventure trade and for the trade which has shifted to the art theatre in search of pictures which are fearlessly true to life, said spokesmen. The Dollar Bills were pragmatic enough to canvass friends in the field for a best selling strategy. 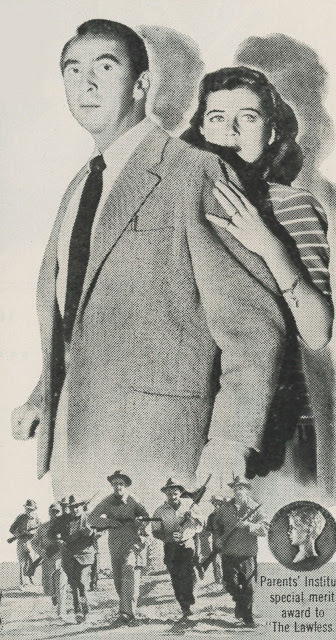 These two spent at least as much time in far-flung showman offices as on movie sets, and knew well that theatres were best test ground for promoting. 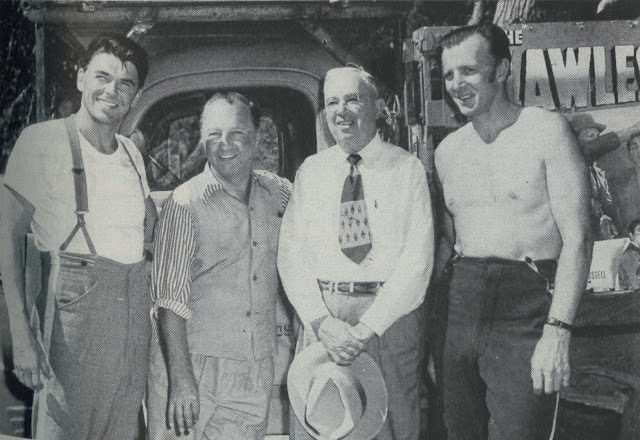 Pine and Thomas figure that "gimmick" selling ideas direct from the owners of the boxoffice will supply plenty of material for a comprehensive exploitation manual which can be used as a guide by all field men, reported Variety. The Independent Film Journal reported P/T clearing decks for their on-the-road market research by insisting Paramount not schedule production for weeks surrounding openings "so it will not interfere with extensive pre-release ballyhoo junkets conducted by the team." 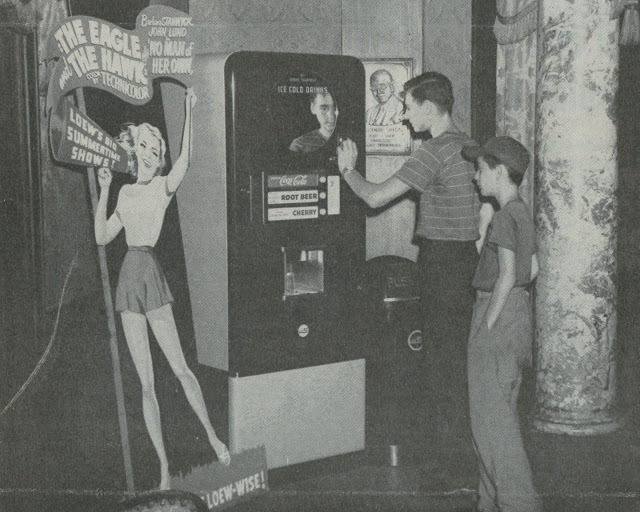 In fact, the Bills brought The Lawless along to opening cities of their April '50 The Eagle and The Hawk, so that they could show the pic to local opinion makers and build anticipation for their release now set for July. 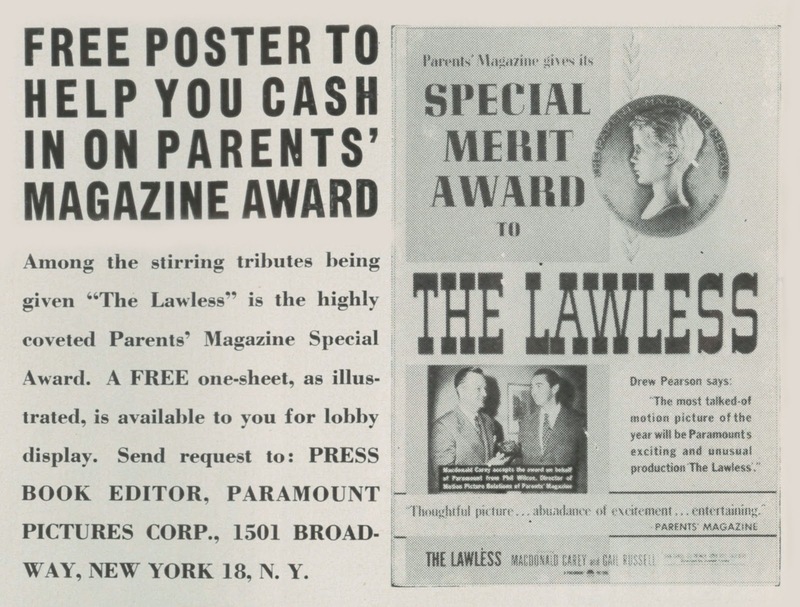 Parent's Magazine gave The Lawless its Special Merit Award in early May after Pine/Thomas advance screened for the editorial staff. A special one-sheet (gratis to theatres) touted the award to further position The Lawless as an attraction well out of the ordinary. But would their prestige actioner attract? 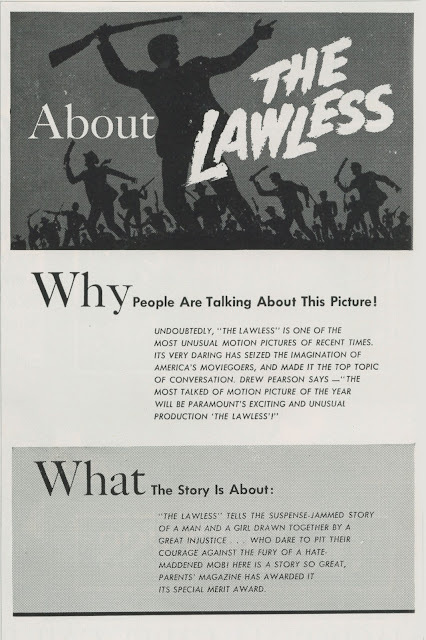 The Bills banked that it would, so much so as to be planning more social-themed dramas, that is, if "Lawless" comes across with a profit, said Variety. Unless that picture does business, added Bill Pine, they (meaning Paramount) won't let us make the others. He hoped to explore problems of modern-day Indians next. Para sales was meanwhile mulling how to sell The Lawless. Pine said long runs in art houses was the answer, to go slowly with the film for maximum penetration. 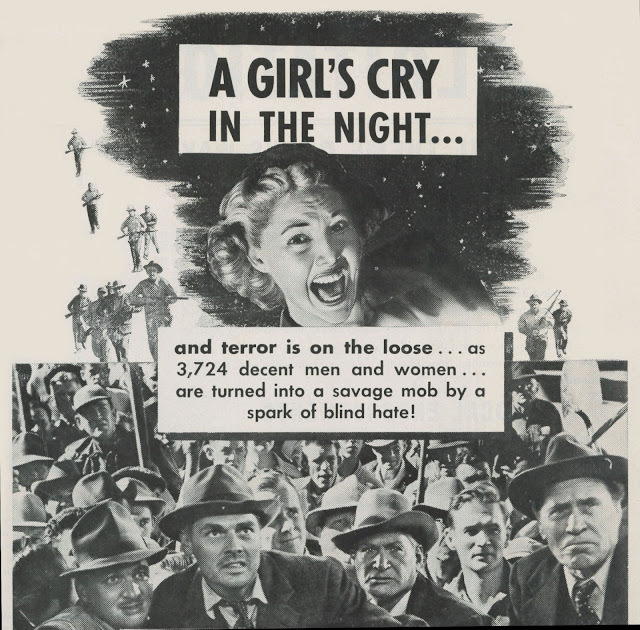 What P/T and Paramount settled on was eight pre-release dates for June '50 in selected cities following a world premiere in San Antonio. The sites were Buffalo, San Francisco, Detroit, Boston, Cleveland, Fall River, Mass., and New Bedford, Mass. The fate of The Lawless would rise or fall upon these engagements. There's a new site recently up and running that commands attention of anyone interested in film history and/or screen formats. Bob Furmanek's 3D Film Archive caps his many years at rescuing Hollywood's dimensional past, and readers will relish these accounts of depth features/shorts brought out of seeming oblivion. Furmanek opened my eyes to 3D Myths he dismantles ... 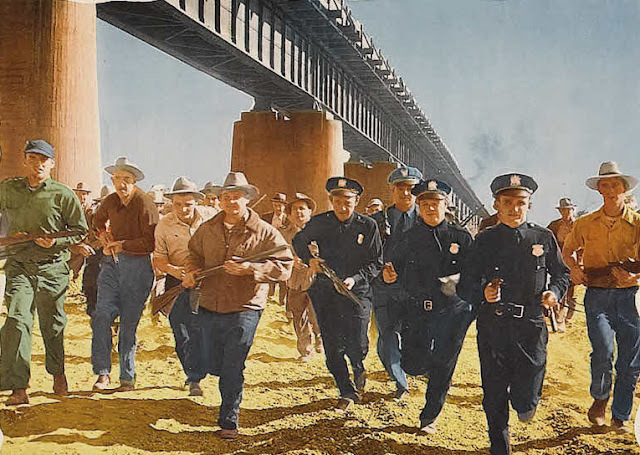 I'd been too long falling for several ... and no one is more scrupulous as to facts than he and noted historian Jack Theakston when they micro-study The 3-D Release Of Hondo --- a lot of misconceptions are set straight here. You needn't be a 3-D maven to find fascination at this address. I was deep immersed by Furmanek's recount of a youth discovering 3-D and how he began life pursuit of that unique format. 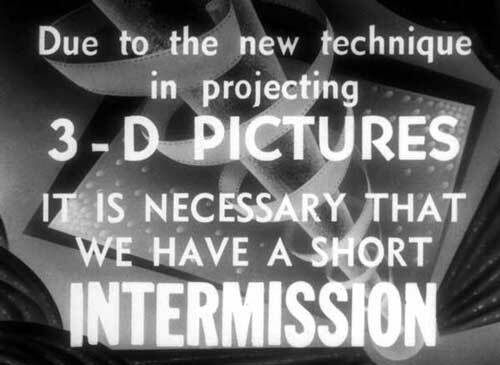 Start perusing 3-D Film Archive and you'll not quit till the deed is done. I'll be going back often as Bob promises further 3-D research to come. Twilight Time's Blu-Ray series continues apace with vaulties out of Fox and Columbia rendered in best-ever quality. I was glad they went to higher-def for all offerings. When would these have ever seen release otherwise? Screen Archives distributes the Blu's along with their fine soundtrack inventory. What with all this and Olive's avalanche of Paramount and now Republic titles, there's never been a flusher time to collect. Twilight promises further goodies --- Bing Crosby in High Time is one I particularly look forward to. Will major studios ever implement such a thing as Blu-Ray Movies on Demand? Noticed today that VuDu currently streams 485 pre-1960 titles in High Definition. The ones I've watched look great. Also there's continuing hope of TCM finally going true HD. Can any insider there tip us off? Finally among books there is a definitive history of RKO from Richard Jewell, foremost authority on that subject and co-author of a previous oversize volume focused on it. 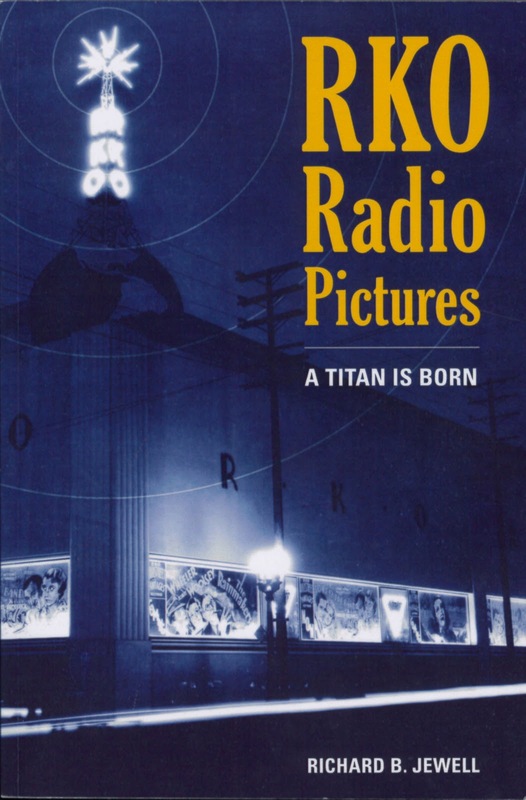 RKO Radio Pictures: ATitan Is Born emphasizes corporate history (quite a thicket!) and reveals acreage of data new to me and I suspect anyone who reads this immersing saga. Prof. Jewell takes us just past WWII's beginning, his Volume One of two ending with the upset of Orson Welles and The Magnificent Ambersons. I wish there were history of all major companies so fine as Jewell's of RKO. He's a crack researcher and engagingly narrates those years of seeming non-stop struggle (did any studio have a tougher time just surviving?). By all means, grab this book for a fascinating lowdown.